This Demonstration models a THz radiation waveform of one cycle moving through air and through biological tissue. The goal is to understand the unique characteristics of THz radiation and its interaction with biological tissue, to assist in the analysis of experiments involving radiation through a biological medium. 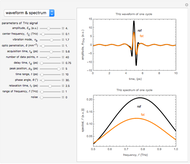 We seek information about peak intensity, reflection, oscillations, resonant absorptions, position of surface, thickness, interface, and interface index. In the frequency domain, this central frequency of this waveform occurs at about 0.1 THz, for a bandwidth of 1 THz. These signal parameters apply for intended applications, including cancer detection. You can select parameters for THz signals in various one-cycle patterns, to tease out the dominant characteristics. 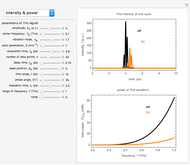 Gaussian sinusoidal pulses of THz radiation have been commonly used in these simulations. Their source is a continuous wave (CW) signal or ultra-short optical pulses of a femtosecond laser. The Gaussian envelope can be characterized by the pulse's central frequency and the ratio of central frequency to bandwidth (quality factor) . In these applications, ultra-short THz pulses are used. The radiation is characterized by an electric field amplitude and a carrier wave of the form . We use phasor notation in a slowly varying envelope approximation. This can be modified by varying the amplitude and time factor to form a pulse with a distorted shape. We can compare the results of the pulse distortion obtained using an inverse fast Fourier transform (IFFT) and direct calculations in the time domain. Pulse duration can be measured in several ways by applying different clipping levels, such as , , or full width at half maximum, and calculating these in terms of either the electric field or the power. 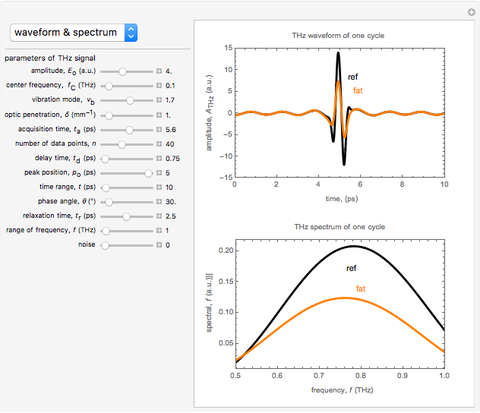 Snapshot 1: The temporal waveform shows that the signal of the THz radiation electric field depends on the time evolution, and its amplitude spectra indicates the dependence of the electric field on frequency. The amplitude spectrum extends up to 1 THz, which is partly limited by the detection response time. When the THz radiation signal propagates through various media, such as air or biological tissue, the waveform deforms gradually throughout the propagation. Air (black) and various types of tissue, such as fat (orange), show the pattern of the one-cycle THz radiation waveform. The change of signal pattern is caused by a change in parameters, with propagated medium characteristics such as absorption or attenuation coefficients, as well as dispersion phenomena. 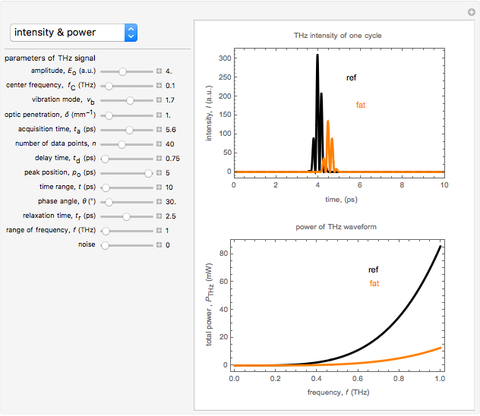 Snapshot 2: Sharp peaks in intensity indicate the magnitude of the energy flux, which is a measurement of the typical THz radiation photon flux. Meanwhile, the time-averaged THz radiation energy flux propagates radially outward with an anisotropic radiated power and angular distribution. The total radiation power increases as the square of the dipole moment and the fourth power of the frequency. The output power of a THz radiation signal emitter depends on the bias voltage and the optical pump power. The maximum radiation power is limited by the breakdown voltage of its source substrate material . For air medium and various types of tissue (e.g. fat ), these show the differing reduction of intensity and power as loss of energy during absorption by the medium. Y.-S. Lee, Principles of Terahertz Science and Technology, New York: Springer, 2008. Yusuf Munajad "Modeling a One-Cycle THz Radiation Waveform Moving through Biological Tissue"